Mid-summer is upon us as we get ready to celebrate our nation's birthday. Despite the extreme heat, we're likely to spend time outdoors at the grill, backyard pool, or ballpark. To keep cool and hydrated, try the easy recipe below that combines two of the five fabulous foods on this list of in-season, super healthy things to eat. Filling up on green beans, and other high-fiber foods, can help you prevent weight gain or even promote weight loss—without dieting—suggests new research in The Journal of Nutrition. Researchers found that women who increased their fiber intake generally lost weight while women who decreased the fiber in their diets gained. The omega-3 fatty acids in oily fish—such as salmon and tuna—can boost your skin’s defenses against UV damage. In a study published earlier this year in the American Journal of Clinical Nutrition, researchers found that those who ate a little more than 5 ounces of omega-3-rich fish each week decreased the development of precancerous skin lesions by almost 30 percent. Scientists think the omega-3s act as a shield, protecting cell walls from free-radical damage. Eating just under a cup of mixed berries (such as red raspberries, strawberries, blueberries) daily for 8 weeks was associated with increased levels of “good” HDL cholesterol and lowered blood pressure—two positives when it comes to heart health—according to a recent study in the American Journal of Clinical Nutrition. Research shows that eating foods that are full of water, such as watermelon, helps keep you satisfied on fewer calories. (Interestingly enough, drinking water alongside foods doesn’t have the safe effect.) At 92 percent water, watermelon is a good source of vitamin C. When it’s the red variety (some are orange or yellow), it also has lycopene, an antioxidant that may help protect against heart disease and some types of cancer. Eating more vitamin-C rich foods, such as oranges, tomatoes, strawberries and broccoli, may be a secret to smoother skin. A igher intake of vitamin C from foods is associated with a lower risk of having wrinkled skin and age-related skin dryness in middle-age women. Vitamin C’s youthful effects on skin may be due to its antioxidant properties, which help protect against ultraviolet rays, and its role in keeping skin firm via collagen synthesis, say the researchers. Bring 1/4 cup each sugar and water to a simmer in a saucepan. Remove from the heat, add 3 mint sprigs and 2 tablespoons Amaretto or Grand Marnier (optional) and steep 10 minutes. Discard the mint; add the zest and juice of 1 lemon and a pinch of salt. 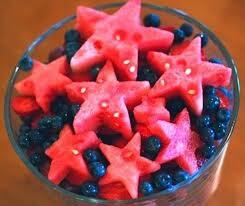 Toss with 2 cups blueberries and 3 cups cubed watermelon. Let stand 15 minutes. Top with chopped mint. Here's a portion of an article reporting the results of a careful study of what people eat when they've skipped a meal or otherwise fasted. If you didn't already know that skipping breakfast (for instance) is a bad idea, this research provides more evidence to support that healthy-foodie "rule." The study also reminds me of another healthy-foodie rule to live by, which is to snack smart. A new study shows that people who sit down to eat after an overnight fast are more likely to ignore protein, fats and vegetables and head straight for high-calorie carbohydrates and starches first. The study also revealed some telling details about food choices and the order in which we eat different kinds of foods. When given the opportunity to eat a salad and a plate of French fries, people who started with the starchy food downed significantly more calories per meal than those who did the reverse. The findings have implications for people who regularly miss meals, whether because of hectic schedules or for the deliberate purpose of losing weight. Nationwide, about 15 percent of adults say they have fasted to slim down, and a number of popular diets encourage intermittent fasting. "I think this emphasizes the importance of controlling your environment as far as the types of foods you're exposed to when you're hungry and how much of them you can get," said Aner Tal, a postdoctoral research associate in the Food and Brand Lab at Cornell and lead author of the study, published in Archives of Internal Medicine. 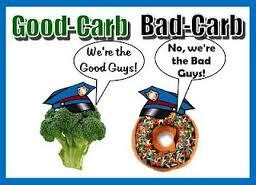 "Because otherwise, you will mindlessly choose foods that are less healthy for you." For regular dieters and people who frequently find themselves ravenous after missing meals, Dr. Tal said the lesson is to keep high-calorie foods out of reach, or at least make them less visible in the pantry or kitchen cabinets. This chart summarizes what our daily eating plan should look like, according to the Federal Government. It's not perfect -- too much emphasis on animal products, thanks to lobbying by the meat and dairy industries. But these guidelines are a step in the right direction, encouraging fruit and veggie consumption. 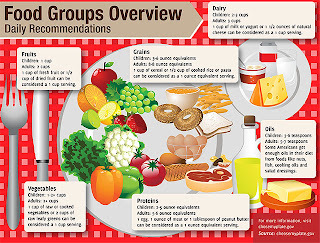 The graphic came from an article about countries around the world that are suffering from "nutritional crisis." Most of them are in Africa and Asia, but #11 on the list of eleven is the good old U.S. of A., where two-thirds of us are overweight or obese. Farmers' markets are great places to buy summer produce of all kinds, but it also can be convenient -- and rewarding -- to grow a few of your own edibles. My yard doesn't have sunshine in the right places for an extensive vegetable garden, but I do grow a variety of herbs in pots on the deck just outside my kitchen. I'll always have fresh mint for juleps and iced teas, basil and oregano for sauces, parsley and chives for garnishes, among other handy culinary embellishments. But if you have the space, it's really quite easy to grow certain vegetables. Green beans, radishes, lettuce mixes, beets, cucumbers and carrots all can be pretty foolproof for the amateur gardener. 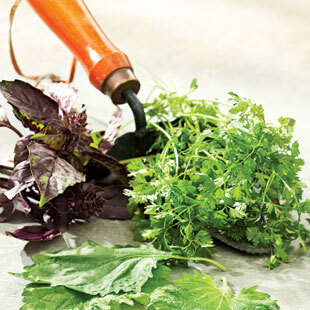 If you're interested in starting a small garden, click here to read about how to get started with these and other veggies and herbs -- and how to use (cook with) each of them. From Falmouth and Woods Hole down in the southwest all the way out to Provincetown at the end of land, the Cape is a lovely place for summer vacation. So many of the towns really do epitomize the notion of "quaint," not to mention picturesque, historic, relatively untouched by time, and quite comfortable. 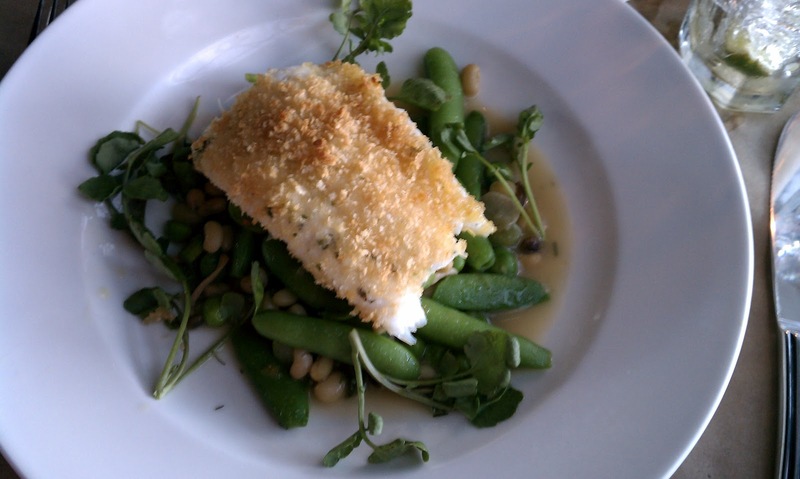 Seafood is of course the area's culinary strength, and you can't do better than the renowned -- but totally unpretentious -- Brewster Fish House, located just about mid-Cape. Their lobster bisque is my idea of a perfect rendition of the dish, loaded with chunks of lobster, redolent with a hint of sherry, and more milky than creamy. The House also makes great fish entrees, and I must mention the owner's carefully selected if short list of wines to accompany the chef's delicious food. We had two dinners there during our six-night stay in Brewster (home base for the trip). We also had a great, inexpensive for the quality level, lunch in Brewster at JT's Fish House, where I got my one and only hot lobster roll of the trip. Major yum. If it hadn't been our last meal on the Cape as we were heading to Boston, we would have eaten there more than once. 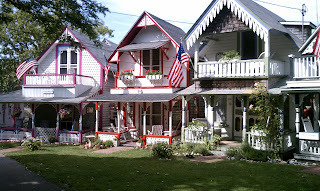 Otherwise, we made day trips via ferry to Martha's Vineyard (see photo of the gingerbread cottages at the Campground in Oak Bluff) and Nantucket -- two islands off the south shore of Cape Cod. Our favorite is the smaller Nantucket, where we love a restaurant called Straight Wharf. The fresh fluke entree with loads of springtime veggies (pictured) was among the very best dishes of the trip. On Nantucket we also had an excellent lunch at Dune, which included my favorite cocktail of the trip, their whiskey smash. 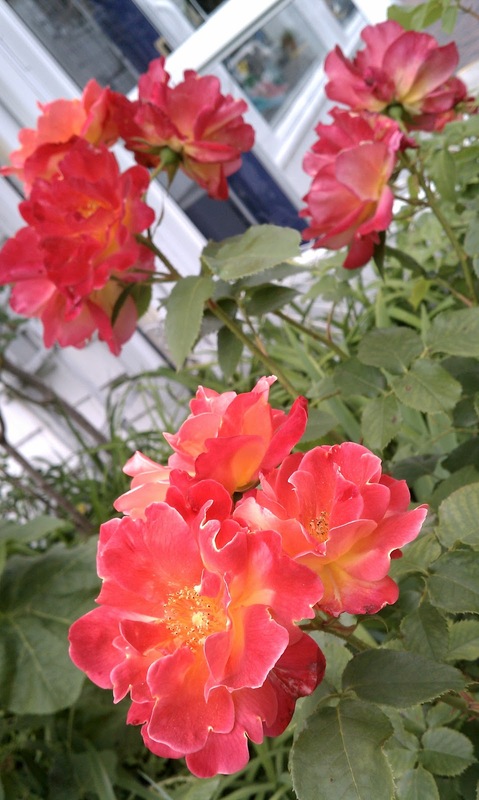 Best shopping on the Cape is NOT in Provincetown, IMHO, but in the town of Chatham. The fish tacos at Impudent Oyster there, with scrumptious grilled tortillas, were out of this world. 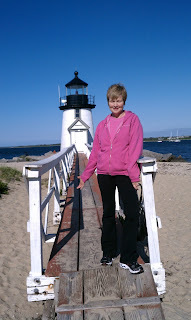 I'll also include a photo of me by the lighthouse we walked to on the island. Now I'm trying to drop the pounds that somehow appeared as a result of all that good eating! "Go to bed slightly hungry" -- brilliant! Can't remember where I read this recently, but it was in a short review of a new book about how to live a healthy life -- and not get fat. The most interesting piece of advice -- in fact, it jumped off the page at me -- was that whenever possible you should GO TO BED SLIGHTLY HUNGRY. I love that idea. 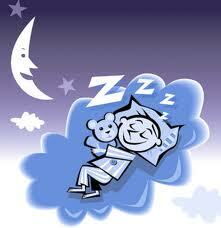 One of the most miserable feelings IMHO is to try to get to sleep after a too-big meal. It seems completely unhealthy to eat a lot within a couple of hours of bedtime. We just returned from a 10-day vacation, which included as always too much calorie consumption. I am afraid to go near a scale until after a few days at home, eating with more discipline. Even then, it feels like I've gained a few pounds that will not come off easily. 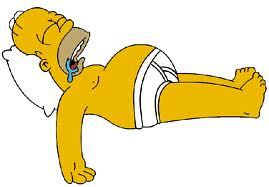 We don't want to look like Homer! It's a lifelong struggle -- fighting the "battle of the bulge," which only gets harder as we age. The following principles (or rules) help keep me from the excess weight, and even obesity, that has plagued some older members of my family. Almost all of these rules get broken on a weekly or sometimes daily basis, but overall if you can try to adhere to them, you should avoid the fate of too many of our neighbors & friends -- compromised health due to poor lifestyle habits. If you don't know why this is my #1 rule, see the movie Food, Inc. (you can watch it online for free at www.pbs.org. I love to eat out, and bringing in cooked food for dinner at home is a nice labor-saving treat. But for the most part if you cook what you & your family eats, you have MUCH better control over the fat, salt and calories you consume. I'm pretty faithful with this one. All that fiber and vitamins are so good for digestion and overall well-being. How is it possible to eat THAT MUCH of anything? Luckily, a serving is quite small: just 1/2 cup of cut-up, cooked veggies or raw fruit, a half of a large apple, one cup of lettuce or raw spinach, etc. I have 2+ servings of fruit for breakfast and another one or two later in the day as a snack. I also snack on cut-up raw veggies (2 servings) and be sure to have 2 servings of veggies with lunch and dinner. It adds up! Also a non-negotiable. Find a way, even if it's taking a short walk in the morning and another one after dinner. This is easy now that we have 12+ hours of daylight. Dietary fat isn't bad, or isn't all-bad, at least. In fact, it's necessary for optimal health. Stick to olive oil, canola oil, peanut butter, nuts in general, fish oil (such as in salmon) and avocado as great sources of fat in your diet. 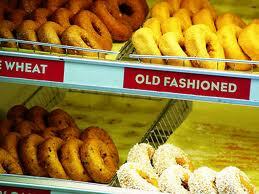 But don't overdo: fat is fattening! Try to use your snack time to get in some of the nutritious stuff your body craves: fruit, veggies, nuts andlow-fat yogurt, for example. Lay off the chips and cookies! I know this is hard. and we won't always live up to it, but try to make smart snacking your default position. Here I mean pay attention to symptoms and go see a doctor if weird stuff happens. Look out for spots on your skin that change shape or suddenly appear and stick around awhile. (Skin cancer is the fastest growing type of cancer in the U.S. today, thanks to our heedless sun exposure when we were younger.) If exercising inexplicably becomes harder, something might be going with your heart or blood pressure. Look into it! Relates to #3 above, of course -- while cooking what we eat generally turns out to be healthier, dining out is one of life's true pleasures (IMHO) and shouldn't be eliminated. But don't go hog-wild, even for the special occasions like your birthday or anniversary dinner. You probably know these things, but to reiterate: don't get the fried, "crispy" or sauteed options; avoid the margaritas and martinis and stick with wine (not always easy! 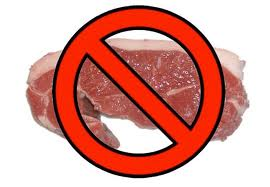 ); lean toward fish instead of pork, beef, or other red meats; skip dessert or at most share with at least one other person. No exceptions! You'll jump start the metabolism to get busy burning calories, and you also won't be ravenous by the middle of the day. 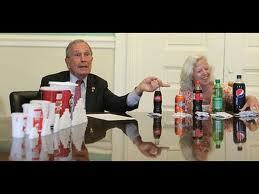 Mayor Bloomberg's proposal last week to ban sales of sugary soft drinks over 16 ounces has caused a lot of controversy. As a healthy foodie, though, I think it is a bold and positive move. When we were in the city last December I was confronted with the results of another Bloomberg anti-obesity initiative: requiring restaurants to post calorie counts. At a Starbucks near my hotel I saw the shocking number of calories in a "tall" (i.e., small) eggnog latte and remarked to the person next to me in line: "Guess I've had my last eggnog latte." And I mean it. 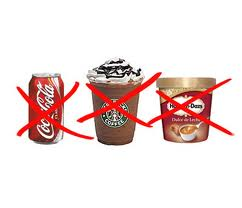 IMHO, Americans need to be reminded at every turn that our culture is overloading us with too much caloric, cheap, way too easy to consume junk food (and drink). We are up against an industrial food system that does very well at (over) feeding the masses, efficiently and profitably. Thanks, Mr.Mayor, for going out on a limb in the name of public health! Up here in Ohio we're just getting South Carolina peaches, which are (IMHO) the best around. In celebration, here is a quick recipe for a peach based salsa, great with fish or chicken, or as an ingredient for tacos night. You can use other stone fruit (apricots, plums, etc. ), but right now I say go with the peaches. Combine all ingredients in a large bowl. Cover and let sit at room temperature for an hour before serving. (Refrigerate if not using within 90 minutes.) 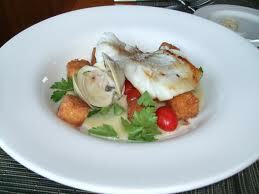 Serve with roast chicken, grilled pork tenderloin or – as in the photo – pan-seared tilapia or other white fish.